This is one very cute, quick read! 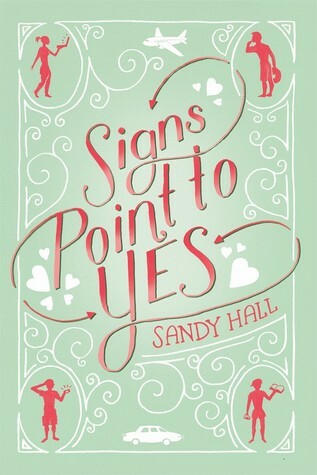 I read Signs Point to Yes in no time, and smiled the whole way. It wasn't perfect, and is probably better suited to middle graders or young YA's, but regardless, it was fun! Jane's mom wants her to go to college, to have a plan for her future. She wants Jane to be more like her smart older sister, Margo. Jane doesn't know if she even WANTS to go to college, and she definitely doesn't want to intern at the college where her mom works. So instead of sitting at home reading and writing fan-fiction all summer like she would love to, Jane gets a job. Babysitting. And who is the brother of the 3 young girls she will be watching? Her old friend, Teo. Awkward! Signs Point to Yes follows Jane during her summer, watching the girls, learning secrets about her "perfect" older sister, Margo... and the burgeoning friendship, possibly more, with Teo. Cuteness definitely abounds, but also lessons about learning who you are and who you want to be as you grow up. Jane learns to stand on her own two feet, with the help of Teo and Margo, and they learn some things from her, too. Jane also realizes she is not the dumb one in the family just because she wants to do different things with her life, and Teo is a huge part of that. Teo also learns some very hard news, and has to be rescued from himself by Jane and Ravi and Margo. The romance that blooms between Jane and Teo is very mild, and sweet. Despite it being a little on the young side for me, I did enjoy this book very much. It was a great retreat from the real world. My only complaint was the simplistic writing style, but as I said earlier, I think it would be perfect for a younger set of YA's or MG's. Signs Point to Yes is a very clean, very cute story with minimal language. Thanks to Around the World ARC Tours for providing me a copy for review!